Winter came early this year. I've already changed my morning routine to watching birds instead of looking at flowers. 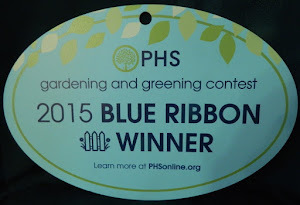 I don't walk around the garden, coffee in hand, planning the day's gardening activities. But take my coffee sitting in my favorite armchair near the French windows in the garden-room, enjoying my feathered friends at feeder and water dish. 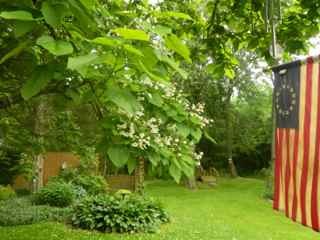 The catalpa tree has a large branch that frames the French windows. H.H. 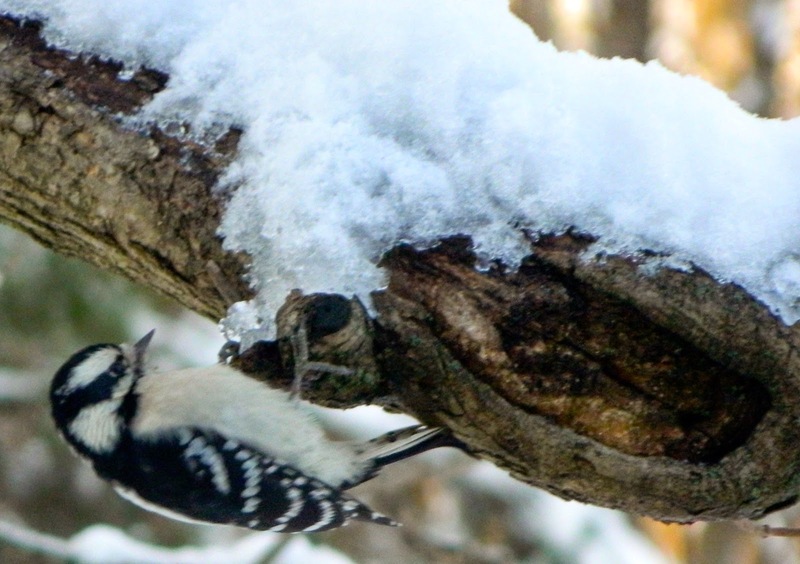 hangs a bird feeder from this branch and the birds sit in the tree taking turn flying to the feeder and to the heated water dish on the porch below. They are in clear view of me and my camera. So I can thank the catalpa tree for bringing the birds to me ... but for how long? 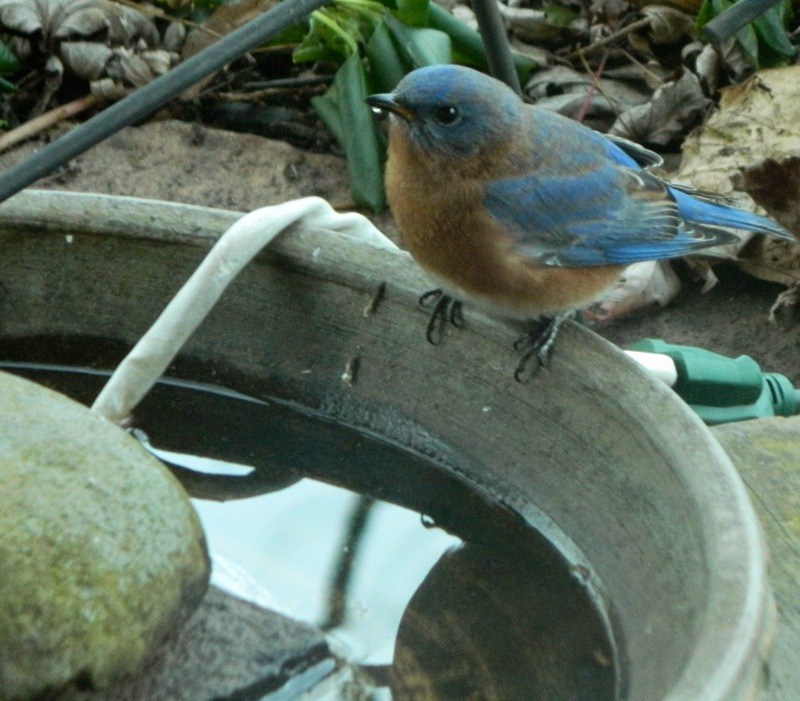 Bluebird waiting to drink from the water dish. H.H. 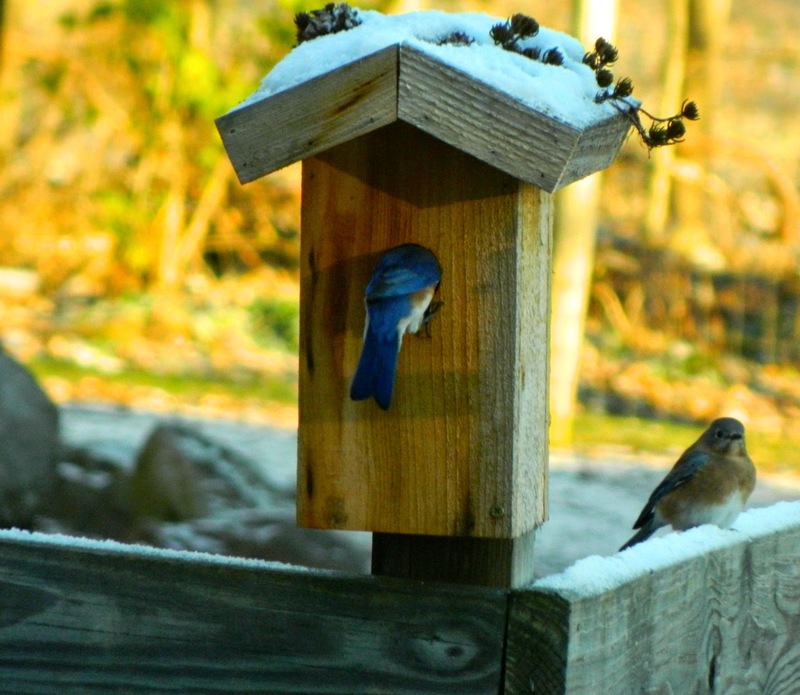 provides a heated water dish for the critters in winter. The northern catalpa, c. speciosa, has large, heart-shaped leaves. 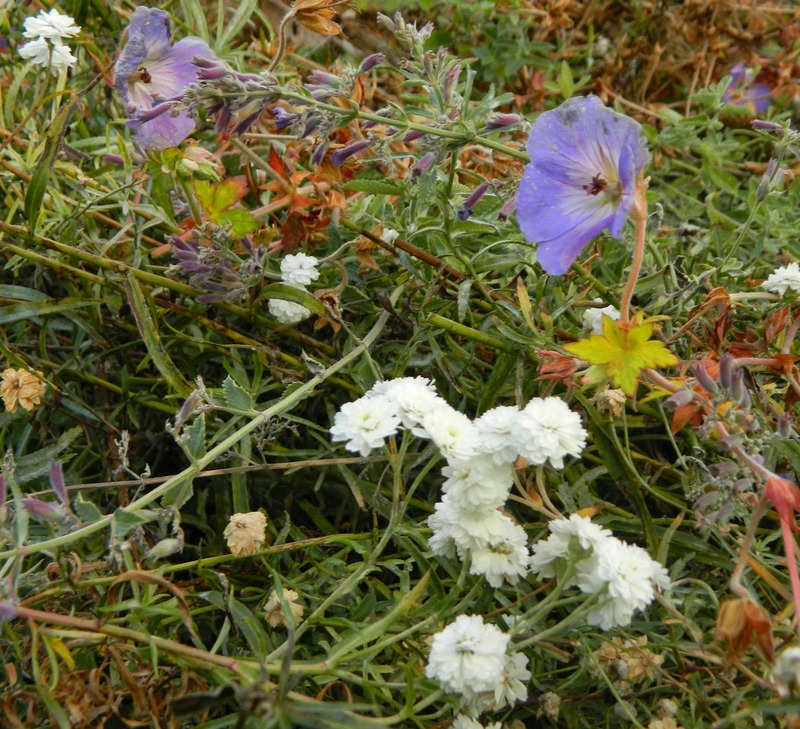 Its early summer flowers become broad, dark, pendulous seed pods that persist all winter. 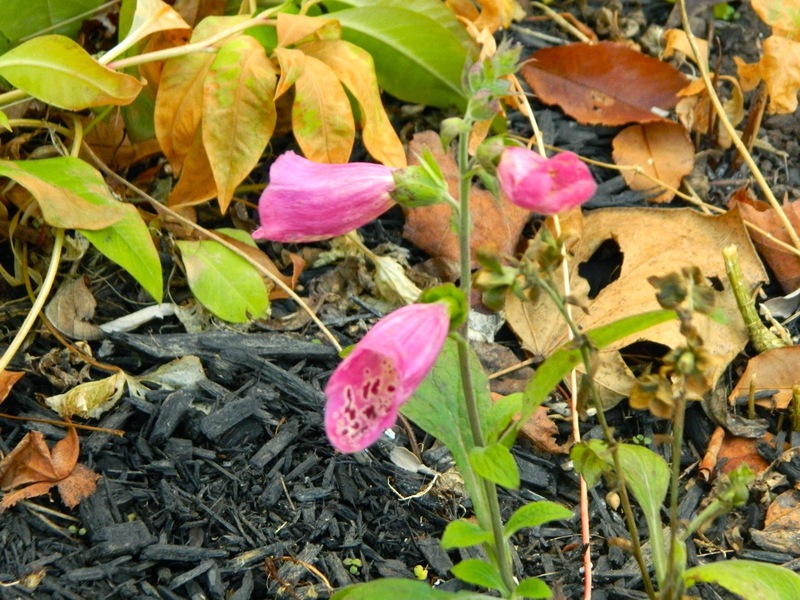 It tolerates dry soil and will grow in part or full shade. H.H. 's mother planted the catalpa to give shade. She raised Shetland sheepdogs and planted two more catalpas near the kennel for the same purpose. Those two fast-growing, short-lived trees are gone now, and I feel sad that the remaining tree is declining. 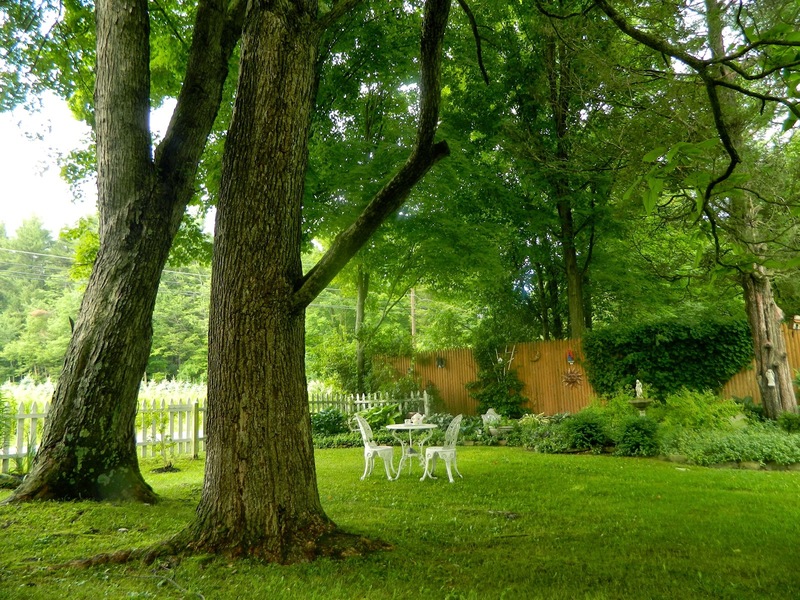 In summer we drink tea under the catalpa and its neighboring maple tree. When H.H. and his sister were children, they slung a hammock between the two trees -- a fond memory. Early summer catalpa blossoms frame the shade garden. 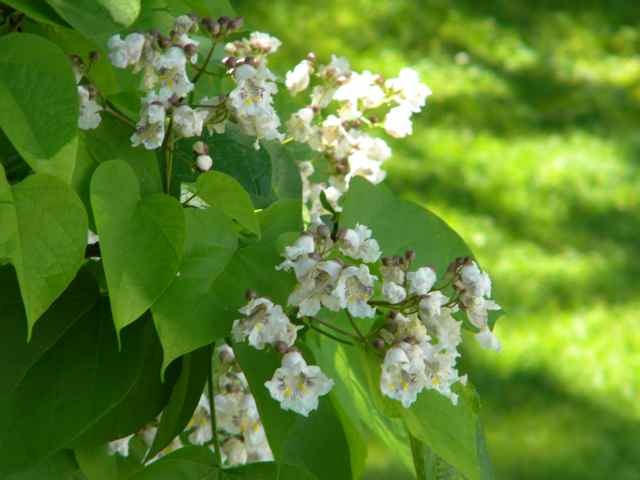 The attractive heart-shaped leaves and white blossoms of the catalpa tree. 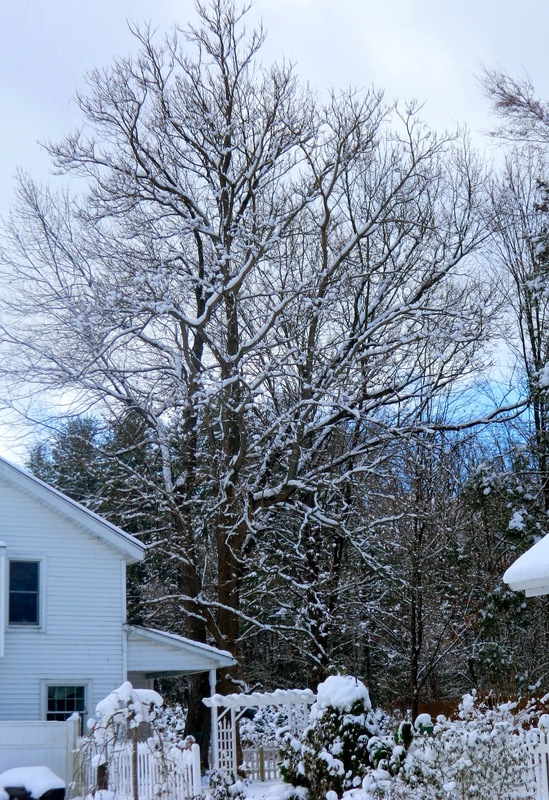 The catalpa and maple trees are very tall, towering over the house. 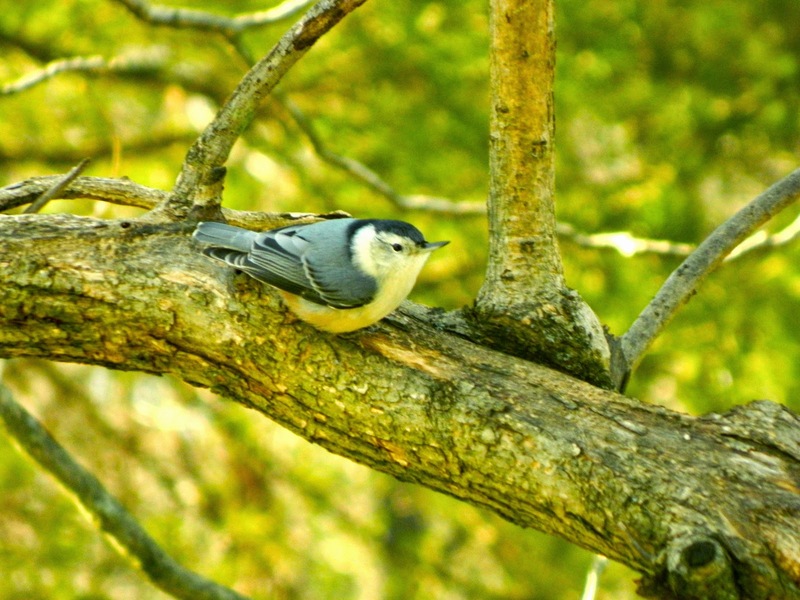 The catalpa tree attracts many critters including woodpeckers and nuthatches. There are lots of squirrels, of course. 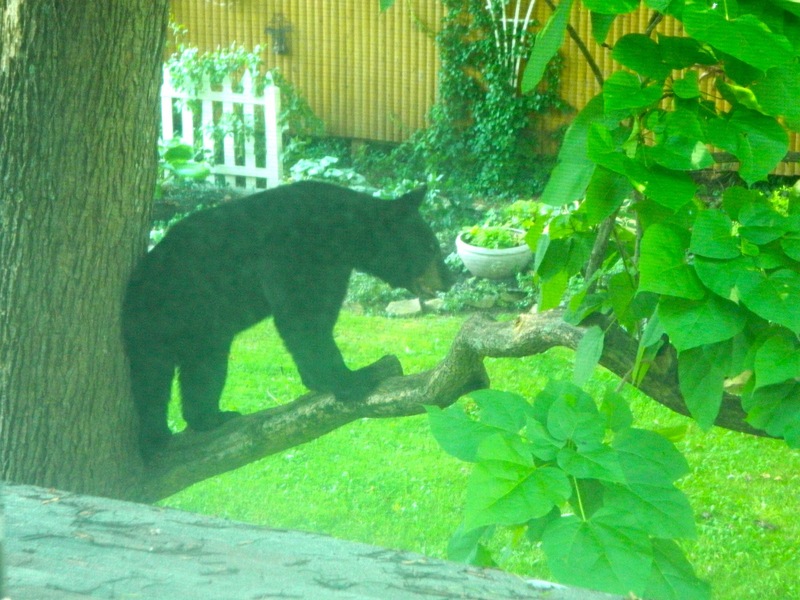 On one memorable afternoon, a bear spent several hours sitting on that favorite branch. 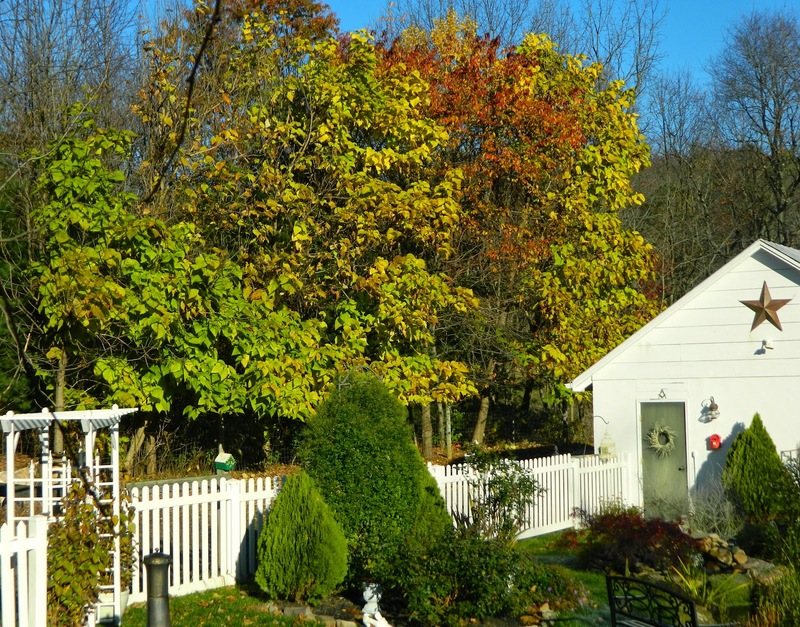 I love this tree, but we have to make the hard decision to remove it before it falls on the house. 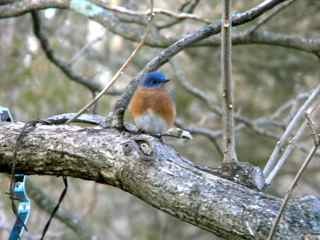 Its branches have little bark remaining and its trunk may be hollow. We should do it soon, but it will be like losing an old friend. 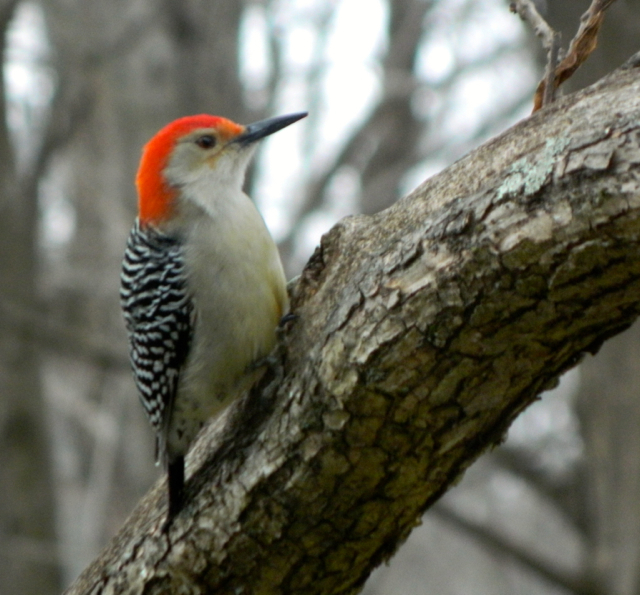 In the meantime, I will continue to enjoy the birds the tree brings to me as I mark the seasonal change. I am joining with Donna at Gardens Eye View for her Seasonal Celebrations. 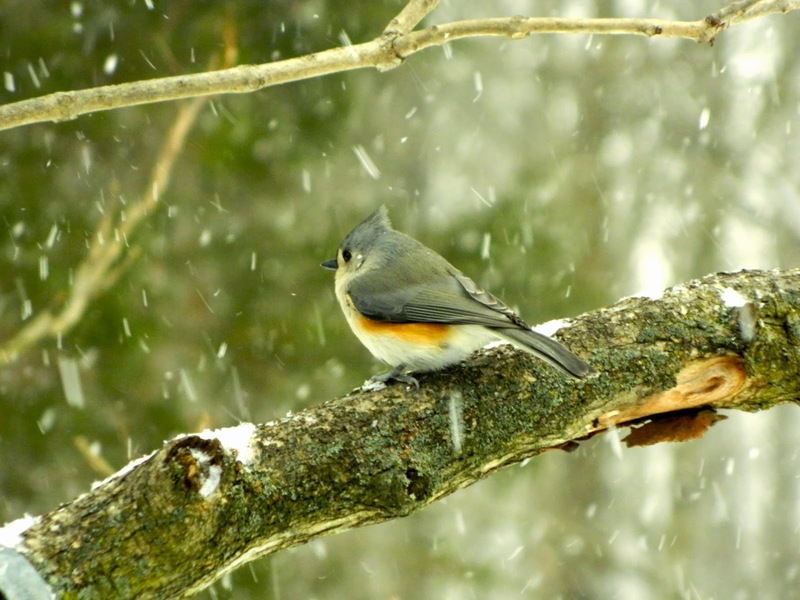 Do check out her 'Winter Wonders' posting and join in the celebration. Enjoy winter, or whatever the season where you live! 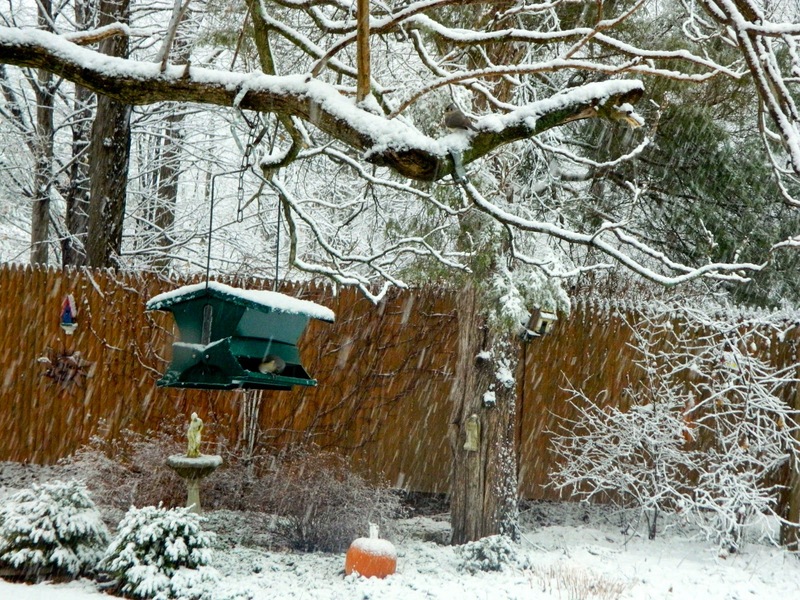 Tens of millions of Americans awoke this morning to record cold and snow. We had only a dusting at my house, but it was too cold for me to venture outside. I took a few blurry pictures through the windows. 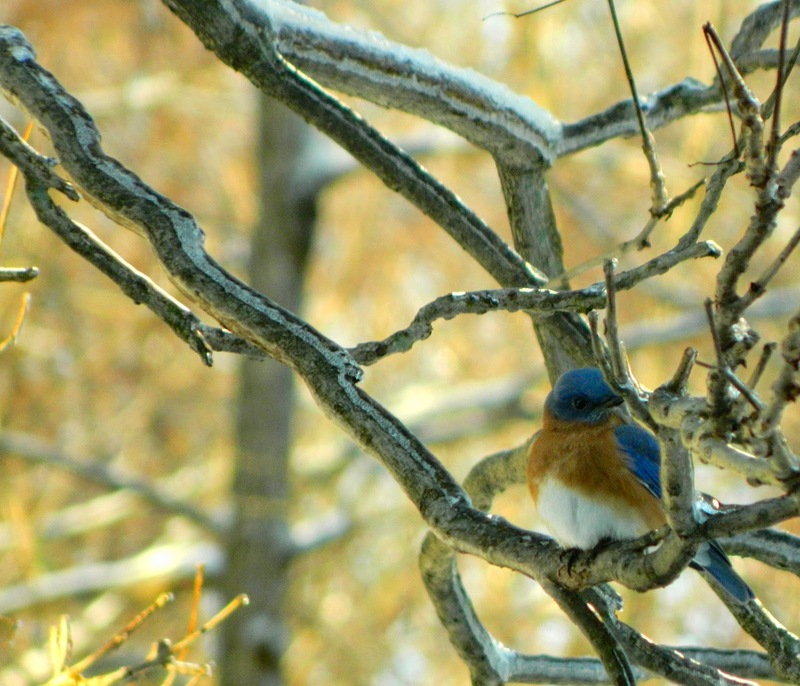 The bluebirds were checking out H.H. 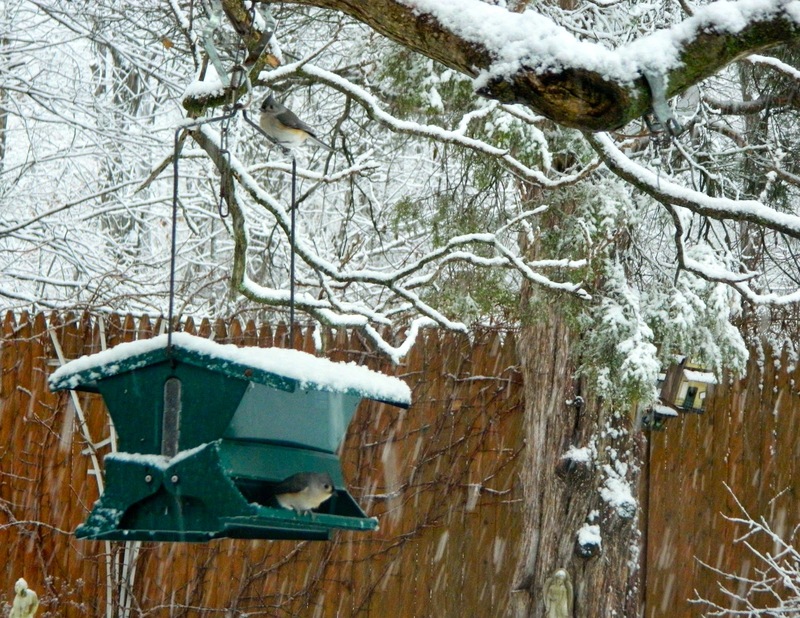 's bird houses as they decided where to shelter in the bitter weather. 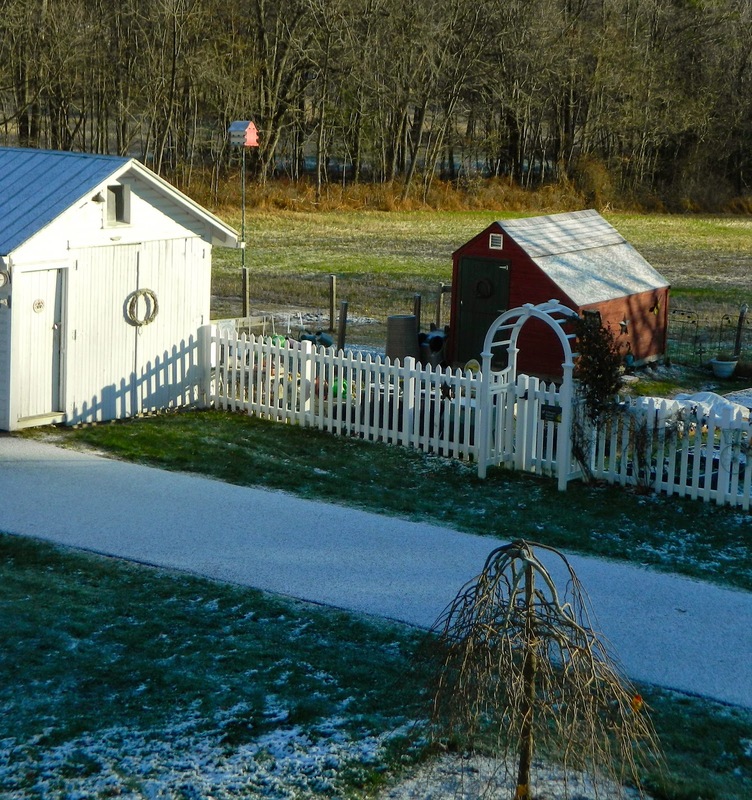 A dusting of snow on the grass, driveway and potting shed roof. 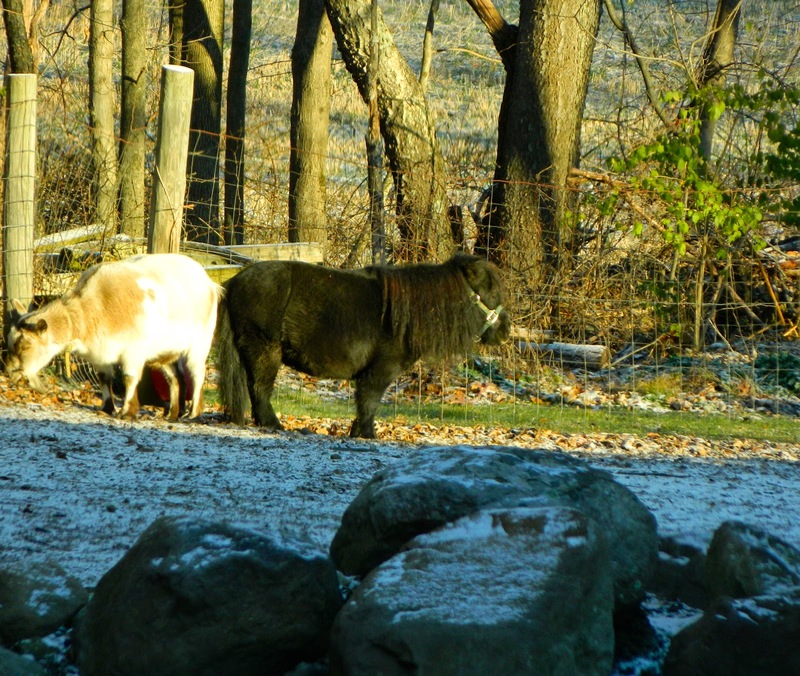 My mini horse and goat find a patch of sun and wait patiently for breakfast. 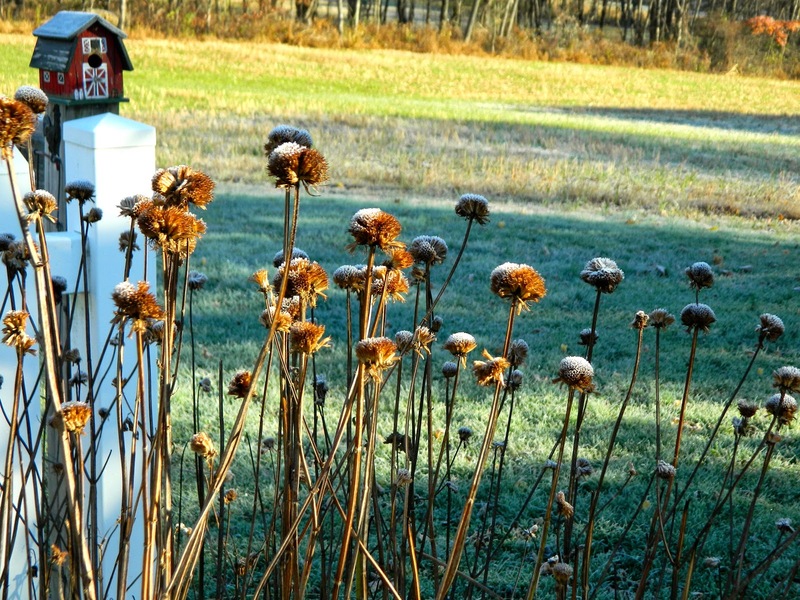 We spent most of this past week outside 'winterizing' so that our garden is ready for whatever Old Man Winter brings. It took H.H. and I more than a day to close the fishpond. We switched off the waterfall and the spitter, cleaned all filters, and put the bubbler in place. We emptied out a third of the water and skimmed the leaves and guck from the bottom. We removed the plants and I cut them back and trimmed the roots. Placing them in milk crates with rope 'handles,' we lowered them into the bottom of the pond. Finally, we slowly added fresh water and salt (for the health of the fish.) We positioned bamboo canes (the former runner-bean tepee) across the pool as supports for netting which we anchored with rocks. The netting will prevent debris from falling into the clean water, and most important will protect the fish from predators. 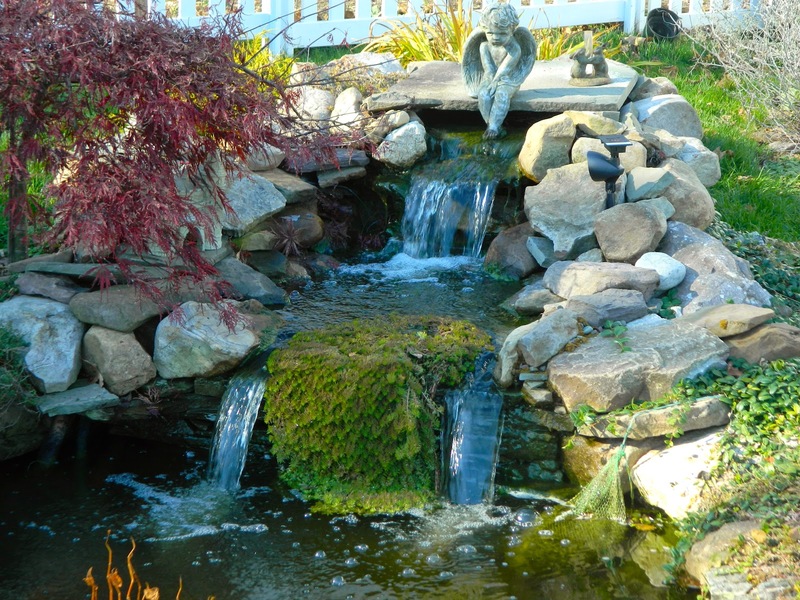 I always feel sad when it is time to switch off the waterfall. I like the way the parrot's feather grew down this year. We take all plants out of the water and cut them back, then place on the bottom in crates. 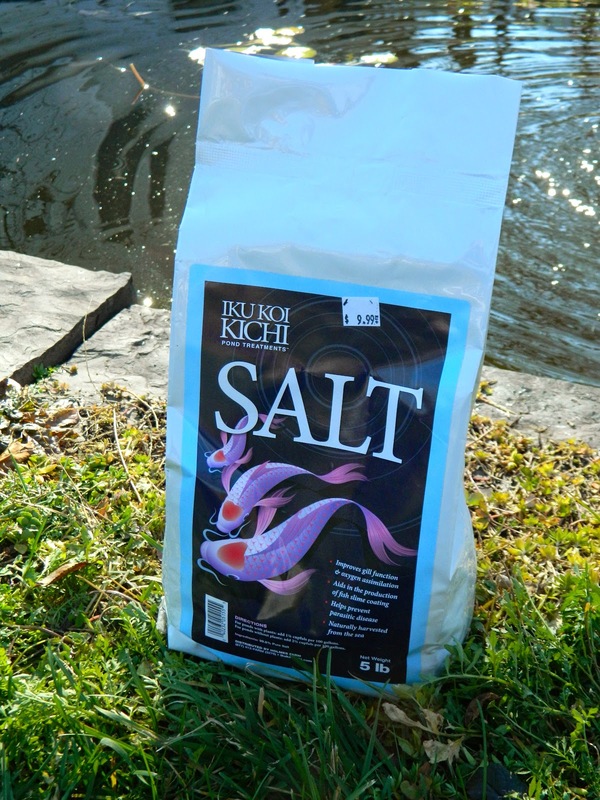 Wet added salt for the health of our koi. 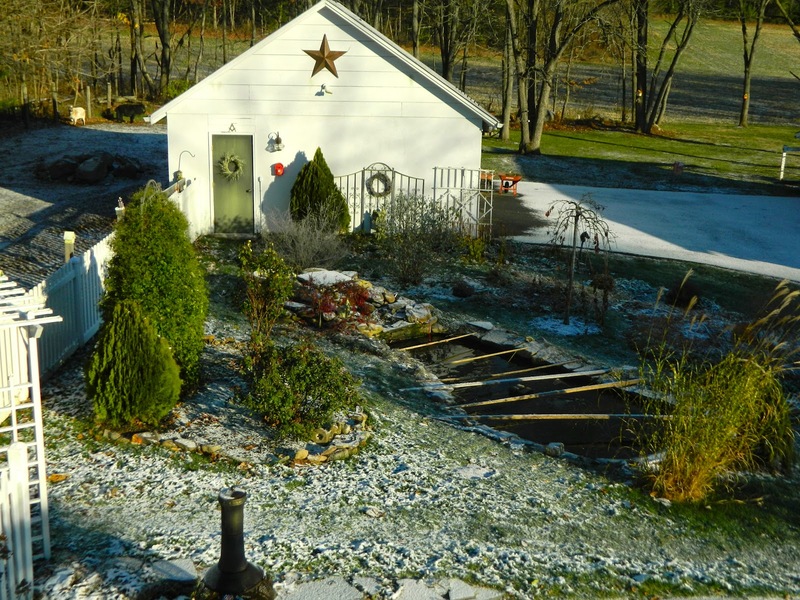 The pond this morning with a dusting of snow around it on the grass and driveway. 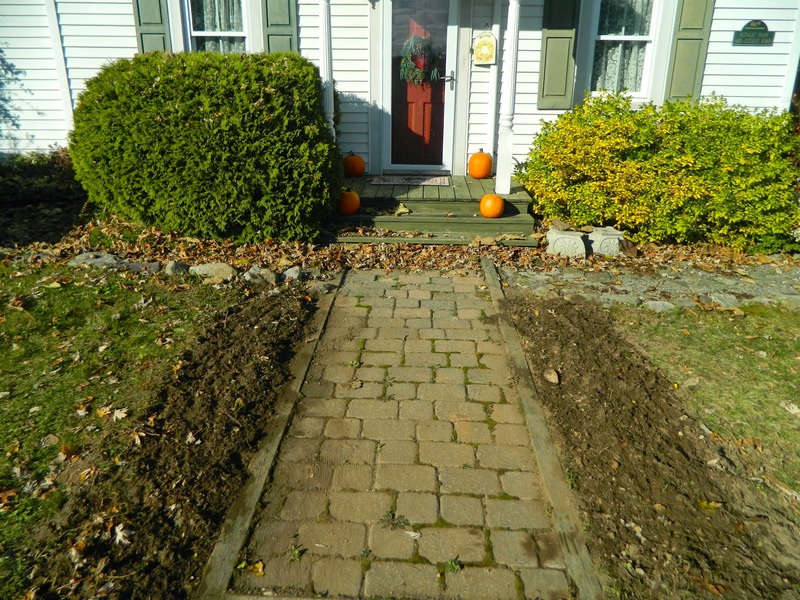 As well as winterizing the fishpond, we cut back perennials, weeded, and raked leaves. 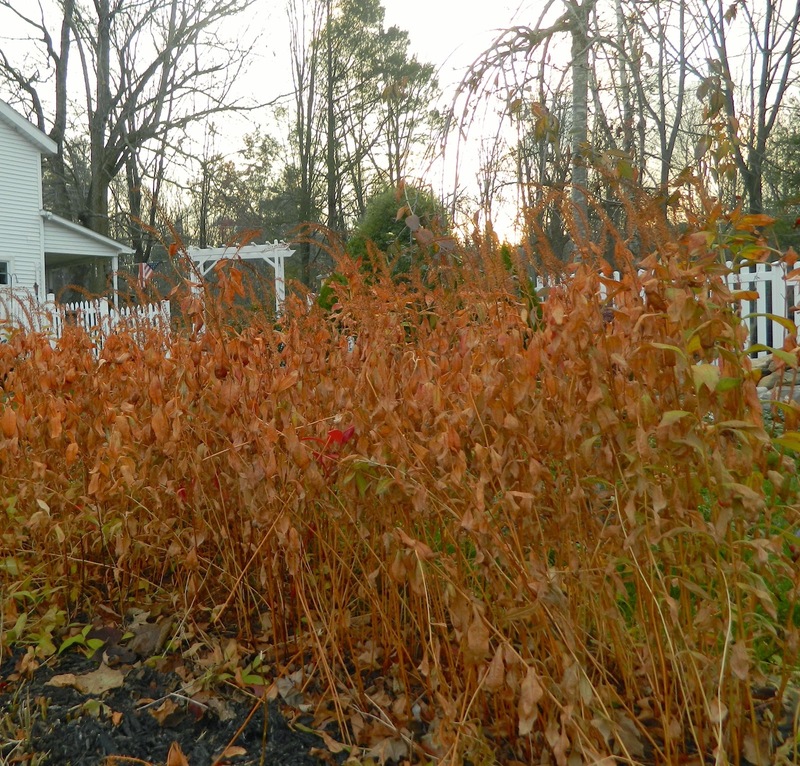 I love the fall color of the gooseneck loosestrife, but it had to go. H.H. uses a hedge trimmer to cut down large drifts of plants like this. 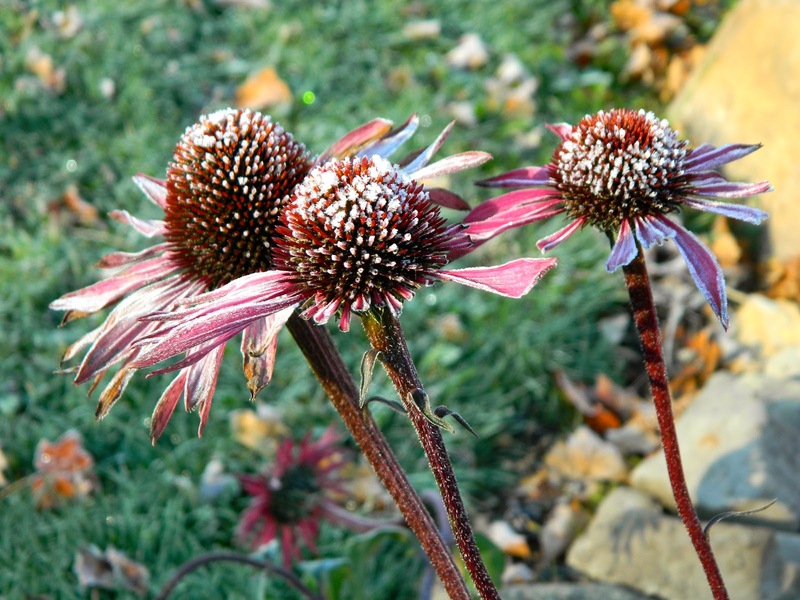 It is Garden Bloggers' Bloom Day, but I'm afraid my fall blooms are now just a memory. I am glad I took some photographs this week before they all disappeared. Several blooms survived the frost until this morning. The very last of the roses. 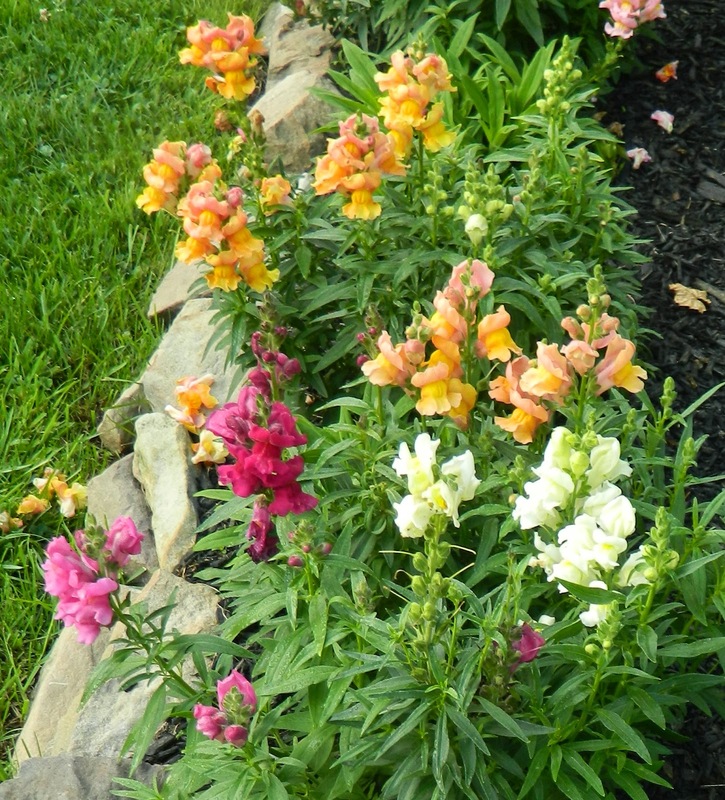 The snapdragons hung on until the very end. One of the most time-consuming jobs is putting away all the statues, garden ornaments, and patio furniture. We almost finished. 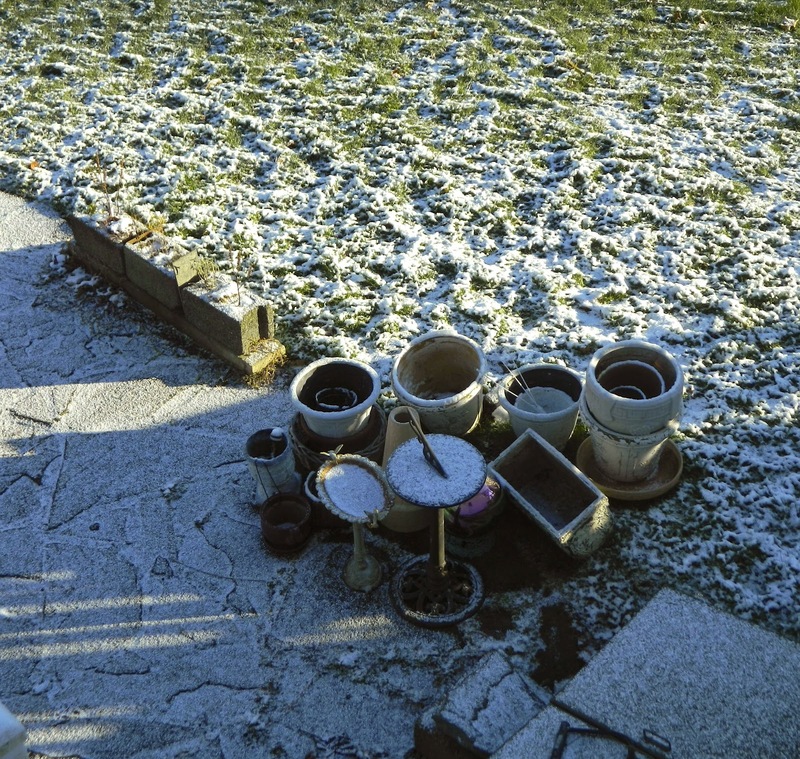 This morning, just a few pots and a sundial are waiting to go down into the basement. 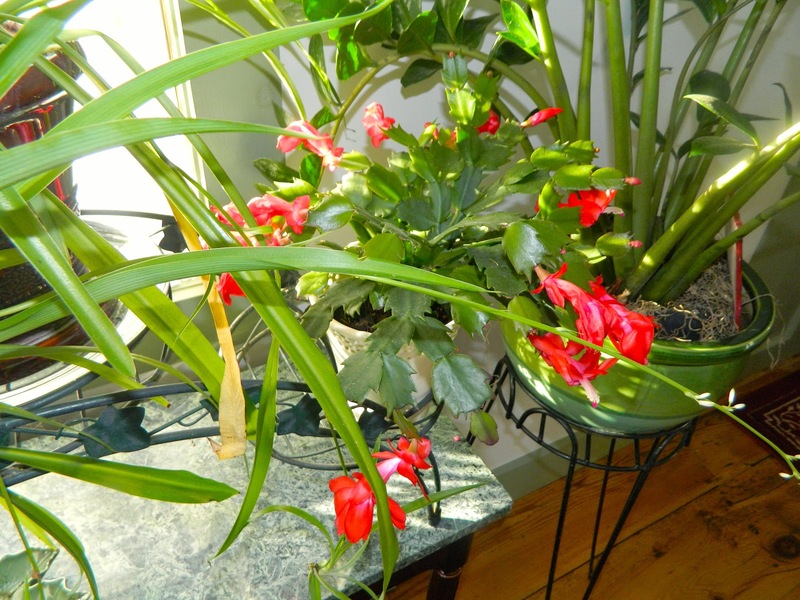 Although the garden flowers are gone, I have a beautiful Christmas cactus in bloom in the house. 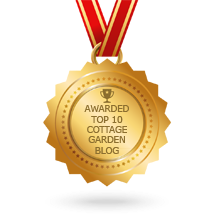 So does Carol of May Dreams Gardens who hosts Garden Bloggers Bloom Day. Do check out her posting. 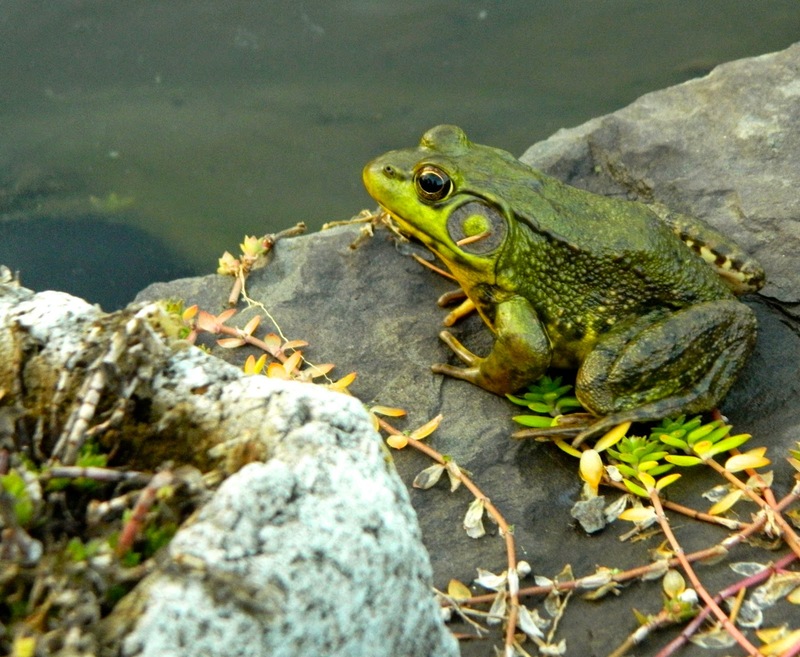 Earlier in the week we saw the last frog to be awake this year! 'The weather outside is frightful' across much of America with early snow and record cold temperatures. It's due to arrive in my backyard before the weekend. 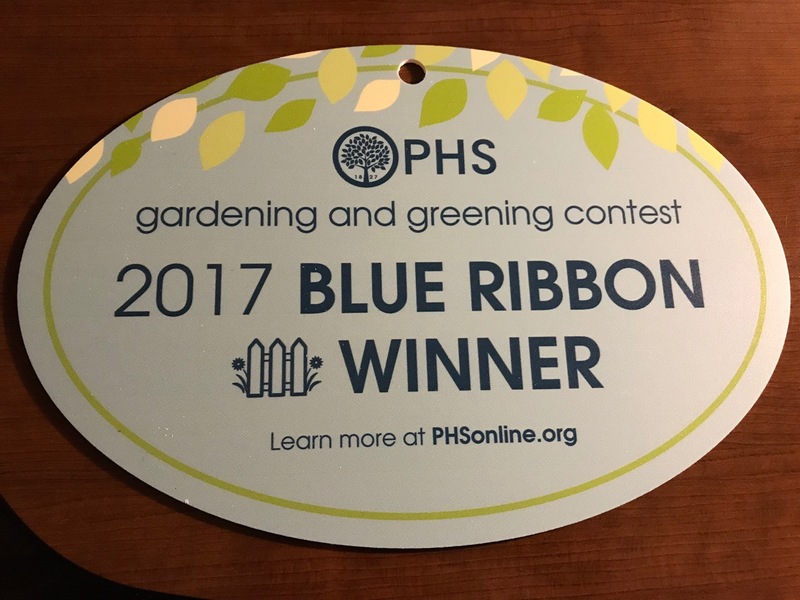 It is time, therefore, to plan some indoor gardening activities -- can't go too long without getting dirt under the fingernails. 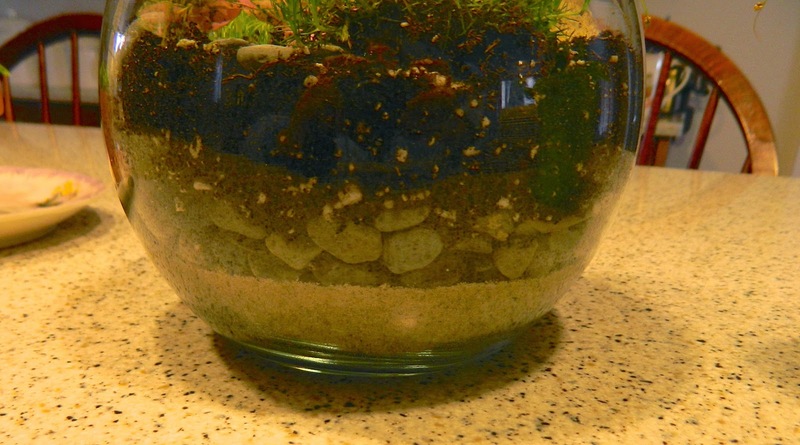 How about making a terrarium? Wardian cases (click for info) are lovely, but expensive. The Wardian case was popular in the nineteenth century and I love the antique look. You don't have to spend a lot of money on a suitable container, however. You can use a fish bowl, brandy sniffer, mason jar, spice jar, vase, candle holder, a cloche cover -- the possibilities are endless. Look for containers at the Dollar Store, floral supply store, garage sales, and maybe you have something around your house. The mouth size will determine if you use your hands or tweezers. You have to decide whether you want a covered or open container. My first attempt (pictured above) was open. 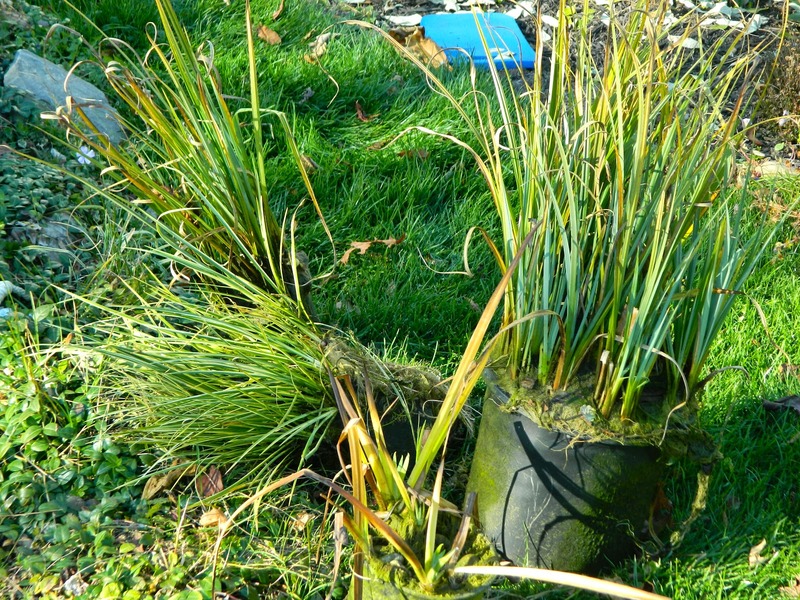 You may want to choose your plants first and that will help you decide your container type. 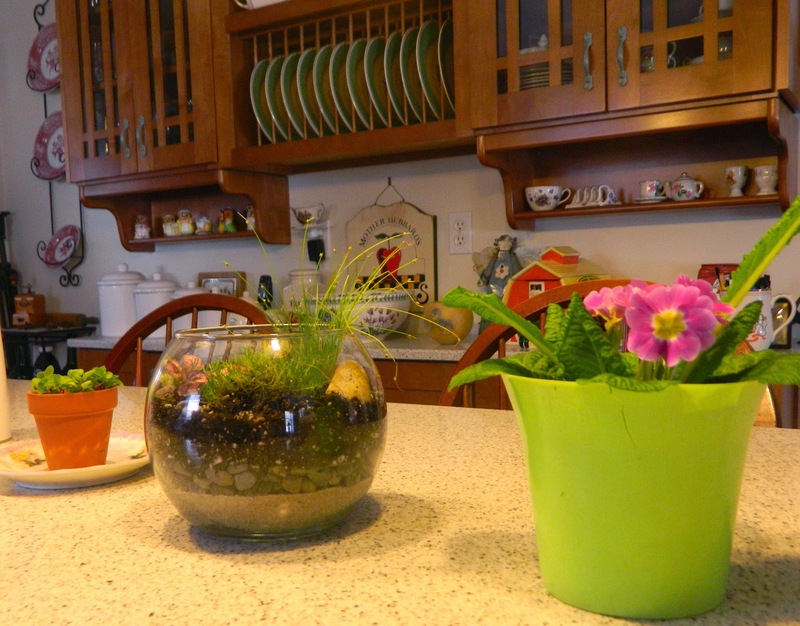 Succulents work with an open container where they can receive more light. 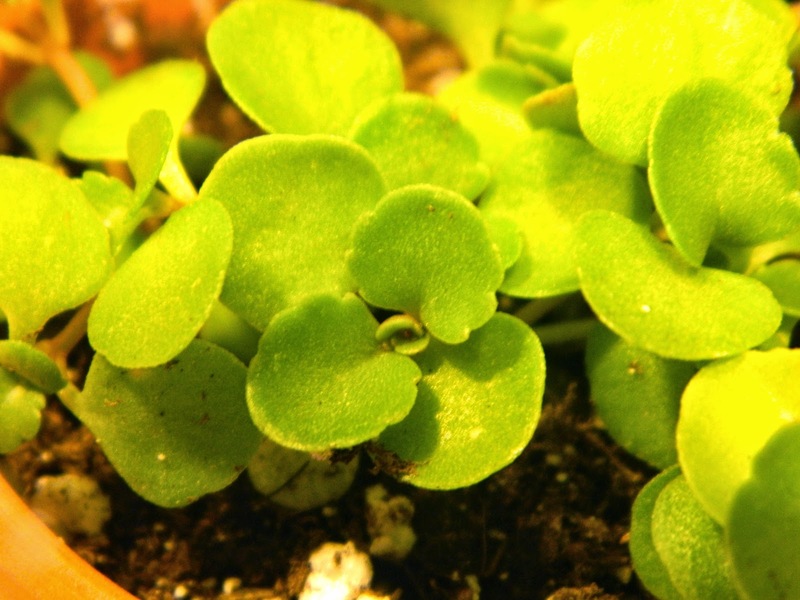 Ferns of all types, miniature orchids, miniature begonias, miniature African violets, and Soleirolii (Baby Tears) are some examples. 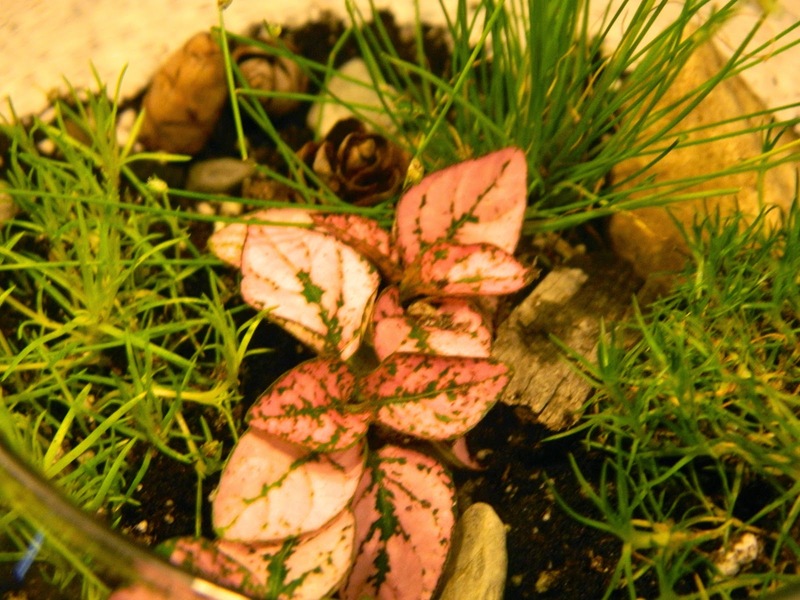 In my terrarium I used Hypoestes (Polka dot plant), Sagina (Irish moss), Selaginella (Club moss), and Isolepsis (Fibre optic grass). Tillandsia (air plants) are suitable, too -- they don't need soil and love the humidity. 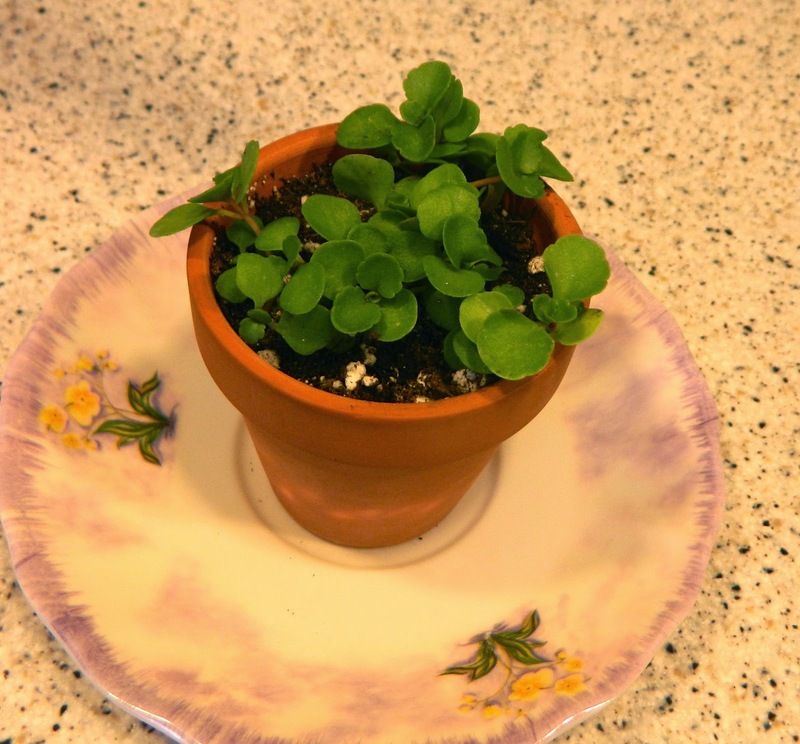 Miniature begonias also like the humidity, but don't like wet feet, so add pearlite to the growing mix. You will need a stick or planting item and a spray bottle. 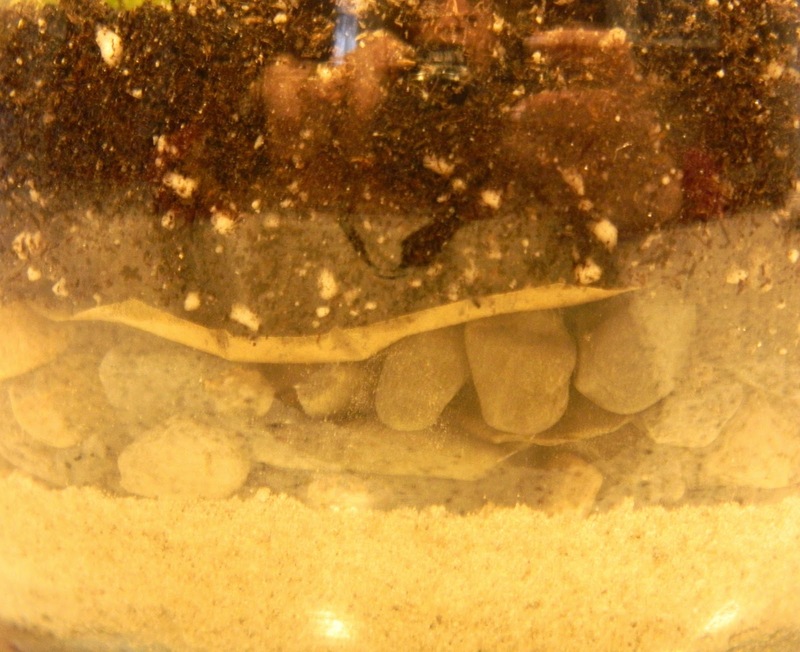 Place a layer of coarse sand on the bottom to hold water. A small amount of activated charcoal will help prevent algae. From bottom to top: sand, gravel, filter, and potting mix. My container is like a small goldfish bowl. Use your stick to make holes in the potting mix as you plant. Water your finished creation utilizing a spray bottle. Accessories are optional, but it is fun to create a theme such as animals, the beach, or Asian. I chose a simple nature theme and accessorized with small cones and rocks. 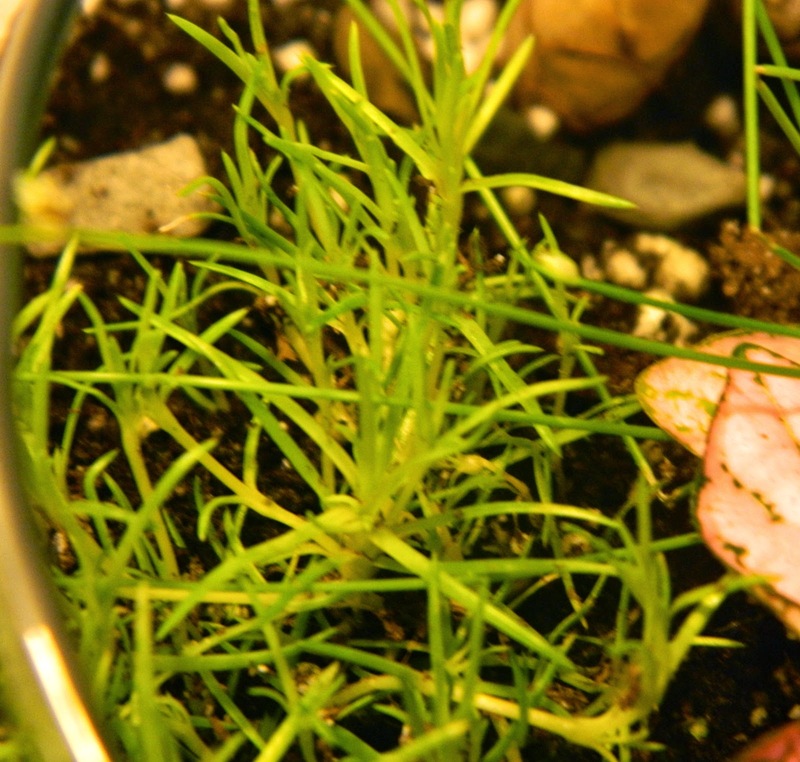 Heat - Excessive heat is a main cause of death in terrariums. Closed glass containers trap and hold heat, so it is important that you don't place it above radiators or in direct sunlight. Light - Place your newly planted terrarium in shade for about a week, then adjust the light according to the plants' requirements. 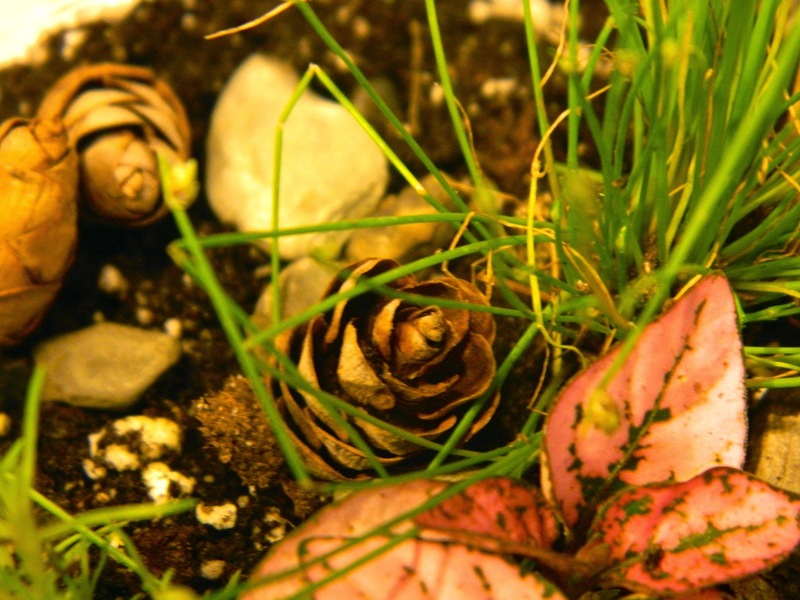 Most terrariums prefer diffused or filtered light. If they receive too much sun the leaves will wilt and develop burned spots. 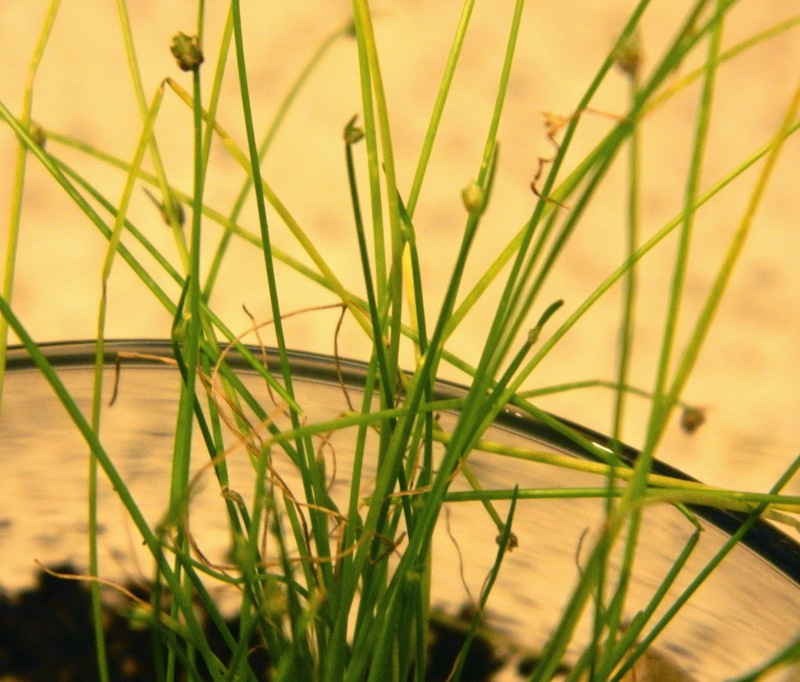 In too little light, plants develop tall, thin stems that are weak and unable to hold up leaves. Increase the amount of light slowly. Water - With an open terrarium test the potting mix before watering. 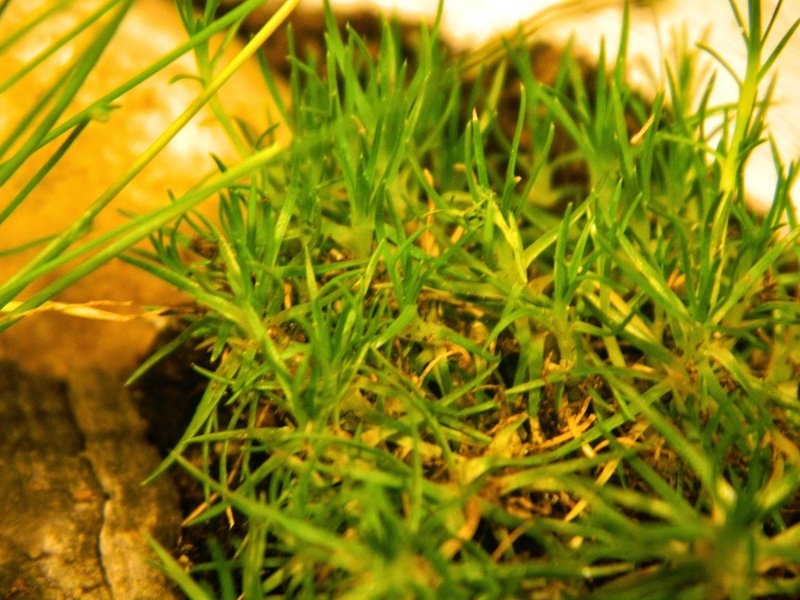 For plants that like moist soil the top earth should feel barely moist before you add water. For cacti and succulents, touch below the surface layer where it should be only slightly damp. Closed terrariums rarely if ever need water. Troubleshooting - Excessive water encourages the growth of molds and causes plant decay. 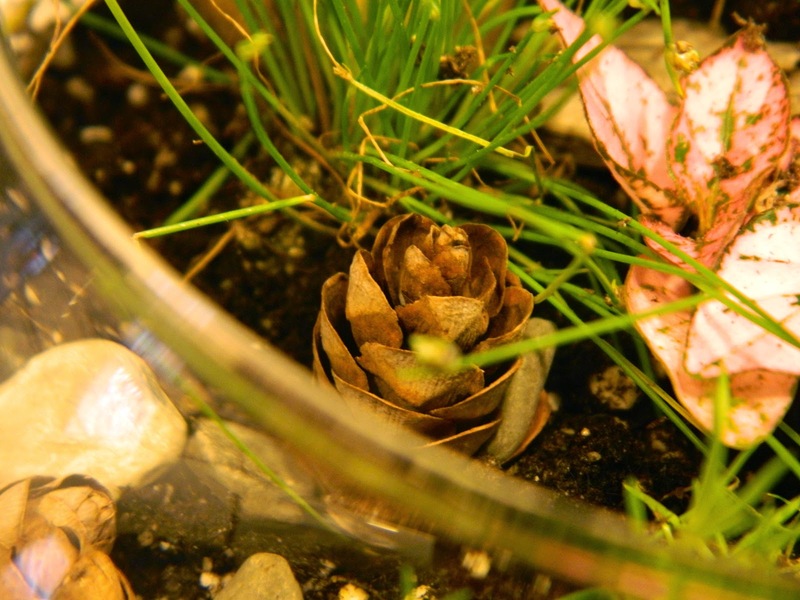 If the walls of the terrarium have more than 25 percent condensation, remove the cover until the walls clear. In a closed terrarium there should be only occasional clouding. The presence of mold or mildew indicates that something is wrong. 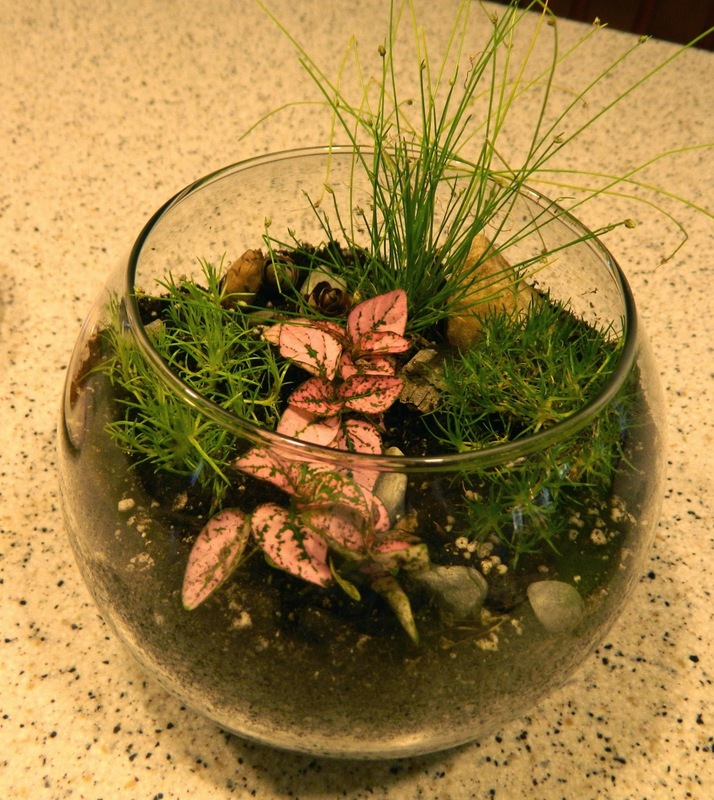 The terrarium may contain too much water and have poor air circulation. Correct this by opening/removing the lid, providing air circulation and allowing the soil to dry out. I left the class with my terrarium and with the added bonus of a small pot of sedum plugs donated by the presenter. I used the plugs when I made my first fairy gardens. Sedum plugs for my next venture. 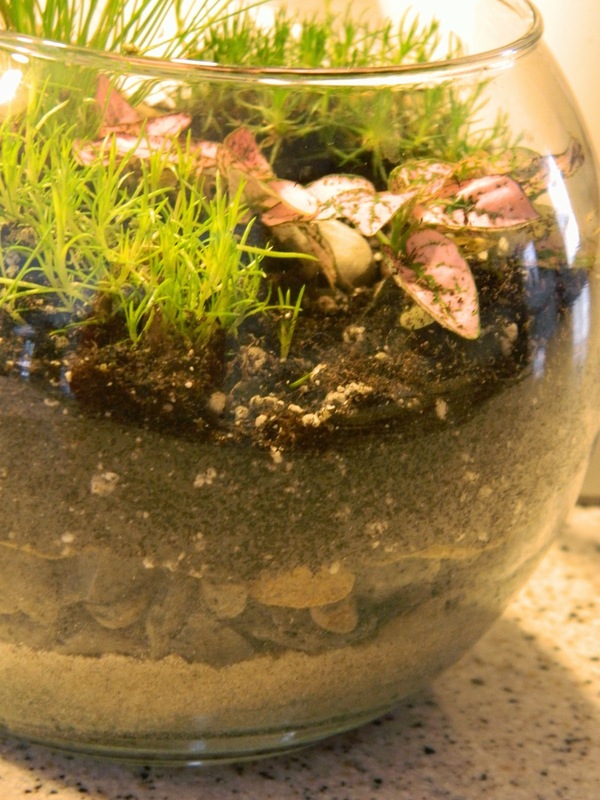 Have you made a terrarium yet? If not, do give it a try. 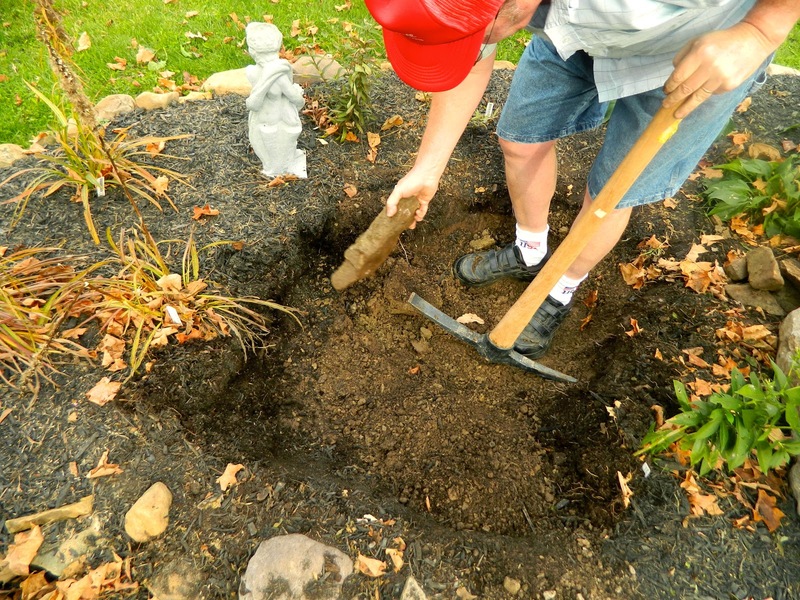 Time to Plant Bulbs -- Get Out the Pickaxe! 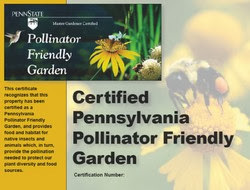 We had our first frost this week which reminded me it was time to finish planting bulbs, a task fraught with obstacles on the plot of land I garden in the Pocono Mountains. I started off quite excited and with a well thought-out plan. I ordered my bulbs from White Flower Farms, a family-owned mail-order nursery located in northwestern Connecticut. The bulbs arrived in beautiful condition; very healthy. I received one hundred of their 'Weatherproof Daffodil Mixture,' fifty mixed crocuses, a dozen Allium 'Globemaster,' and a dozen each of three varieties of tulips in their World Series: 'World Peace,' 'World's Fire,' and 'World's Favorite.' I adore those names. I never planted tulips before because of the deer in our area, but I love them and thought I would give them a try and use a 'smelly' spray to help them survive. The end of the Marigolds. I decided to plant the tulips in the triangular bed at the entrance to our property, en masse to create a drift. At this spot I have self-seeded cleome surrounded by butterfly magnets: phlox, milkweed, liatris, and purple cone flower. I pulled out the spent cleome from the middle of the bed and began to dig. Here was my first problem. 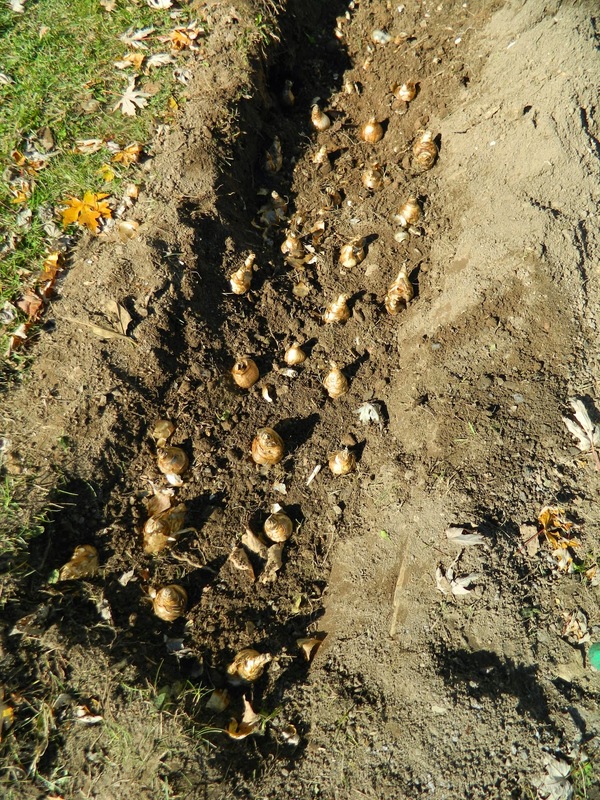 I needed to plant the top of the tulip bulbs 6 - 8 inches deep and 5 - 6 inches apart. 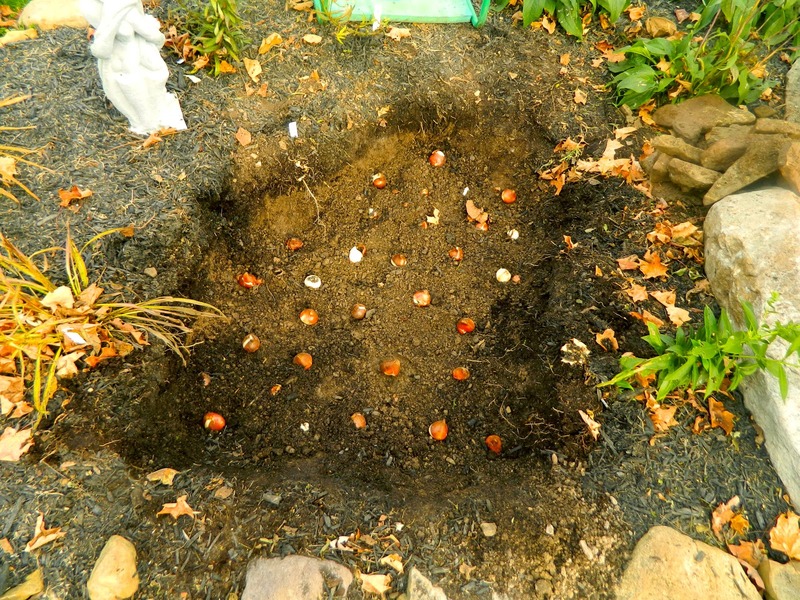 I wanted to dig out the area, place the bulbs in the bottom, then cover them with soil. Sounds simple enough, and so much easier than planting the bulbs individually, wouldn't you agree? I dug down 4 or 5 inches and hit rock. Welcome to the Poconos, Pamela! Fortunately for me I have a trusty helper. I called H.H. who took over the spade. He quickly realized there was no way to get any deeper without a pickaxe. H.H. 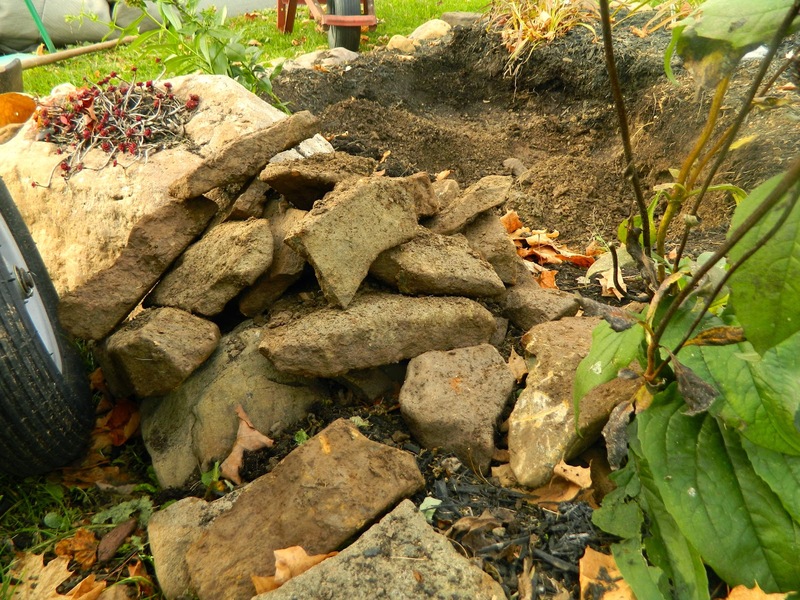 removed the rocks with a pickaxe. These are the rocks that came out of that small hole. Eventually, I was able to place the bulbs in the prepared bed. At this point I made a huge mistake. I should have covered the bulbs with chicken wire or a similar barrier. I didn't. I covered the bulbs with the soil I had removed, sprinkled organic bone meal over the top, and watered the bulbs in. Finally, I added a layer of wood bark mulch. I felt quite pleased with myself with a job well done! Or so I thought. Bee balm Monarda seeds for the birds. I planted the crocus bulbs around the edge of the tulip bed. 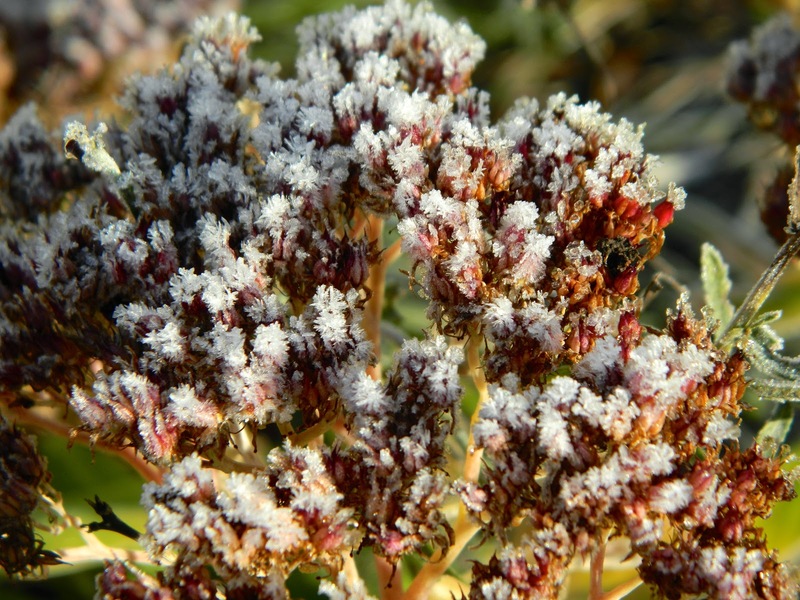 Sedum 'Autum Joy' looking pretty with a coat of frost. 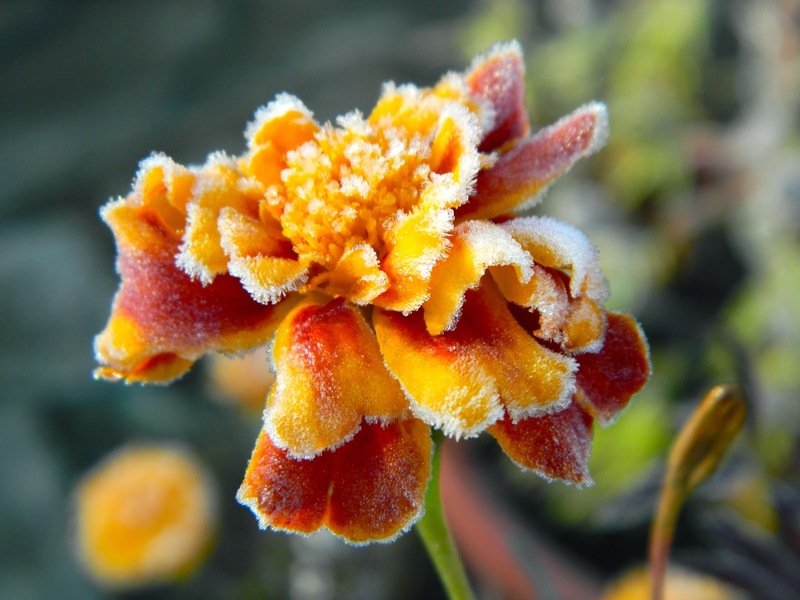 The next day, I went out with my camera to record the first frost. I made a shocking discovery. There were holes all over my tulip bed. 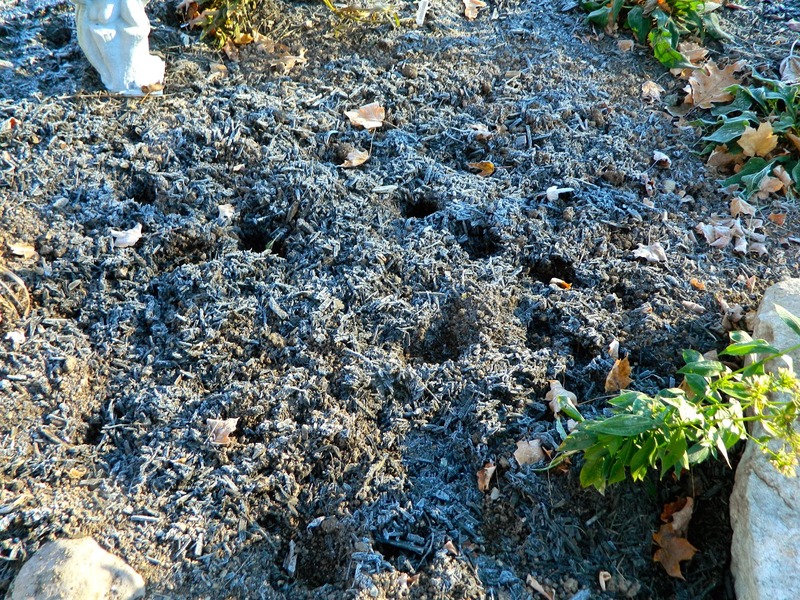 The holes were very obvious in the frosted mulch. I dug down into one of the holes and of course I couldn't find a bulb. The bulbs are now in the winter storage place of a squirrel, or chipmunk, or other rodent. I don't think they removed any of the crocus bulbs, but maybe they did. H.H. was very comforting, as always, even though he did most of the grunt work. He said he was sure the animal didn't remove all the bulbs and we would see some tulips come spring. Bless him! I filled in the holes and decided to plant allium on top of the remaining(?) tulips. Alliums are in the onion family and disliked by animals. The alliums I planted there were some I saved from the previous year (I didn't plant them when I became ill) so I'm not sure they will flower, but at least they may act as a deterrent. I didn't have so much trouble with the daffodil planting job. I want to see a profusion of spring daffs. on either side of the short path leading to our front door. 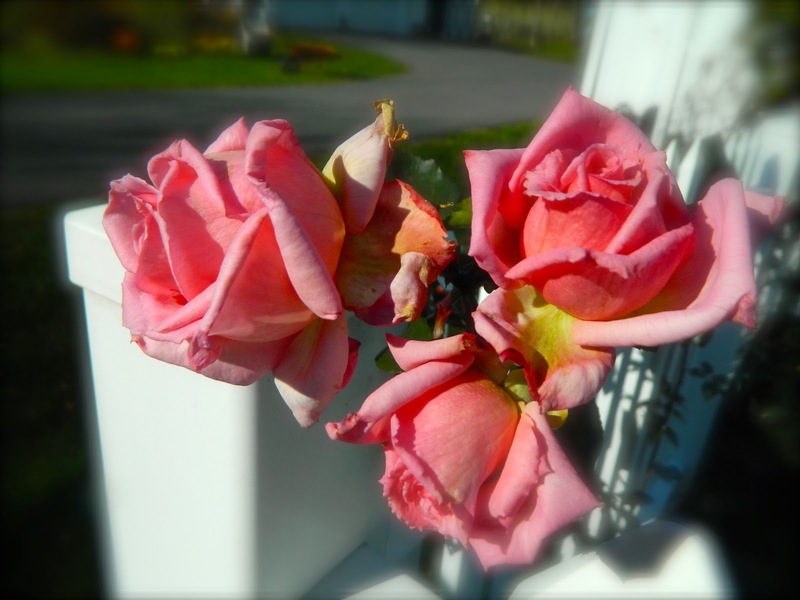 My mother-in-law planted some there many years ago and we remember them fondly, but somehow a landscaper removed them. When I took over the landscaping, I planned on replacing the daffodils, but never got around to it until now. Again H.H. helped me dig the beds. They didn't have to be so deep and there were no rocks, just roots from an ancient maple tree that we removed several years ago. I used the same method as with the tulips. I didn't need to add a wire mesh because the poisonous daffodils bulbs are usually ignored by squirrels. When they were covered with soil, fertilized, and watered I felt some satisfaction. I haven't mulched these beds yet. 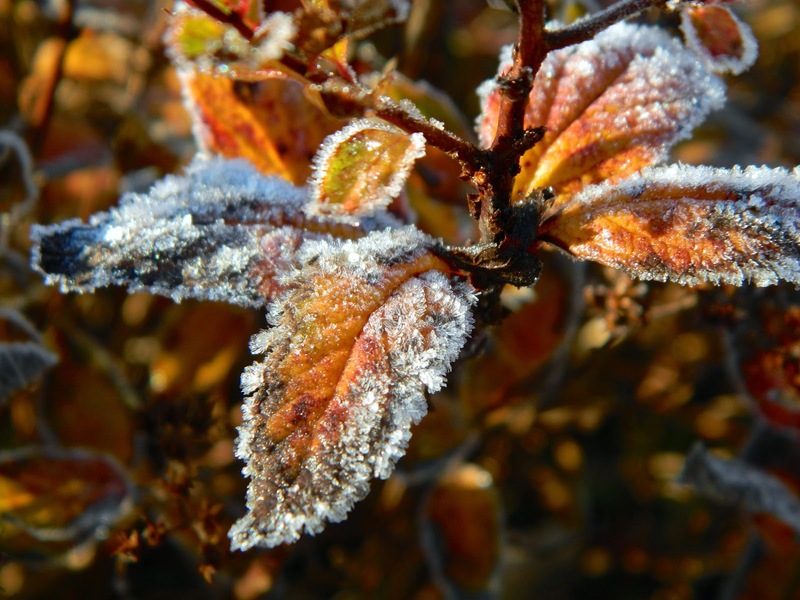 When the ground is frozen I will covered them with evergreen branches to stop the thawing and freezing process. I'm anticipating a beautiful show of daffodils in the spring. It's too wet to plant bulbs today, and I still have the alliums to do. I'm going to place them in existing beds around clumps of phlox and daylilies which should hide their ugly foliage during summer. 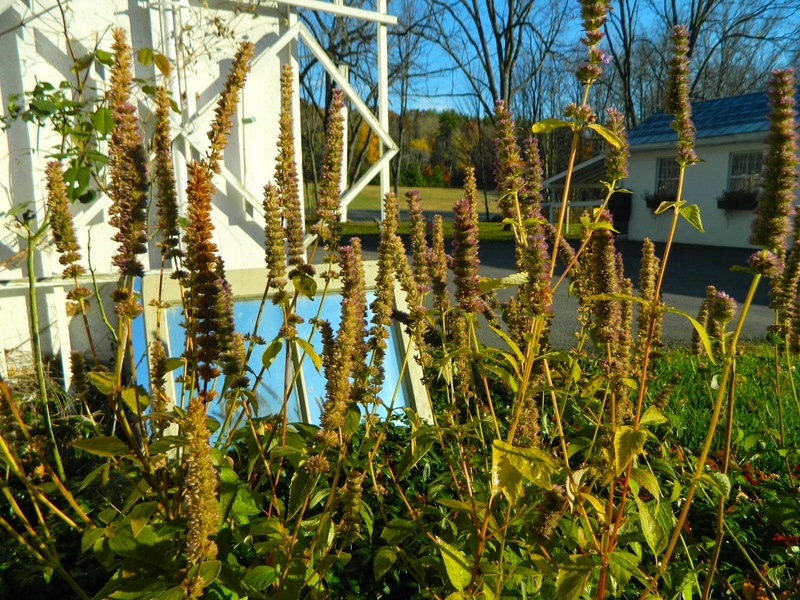 Agastache 'Blue Fortune' -- more seeds for the birds. 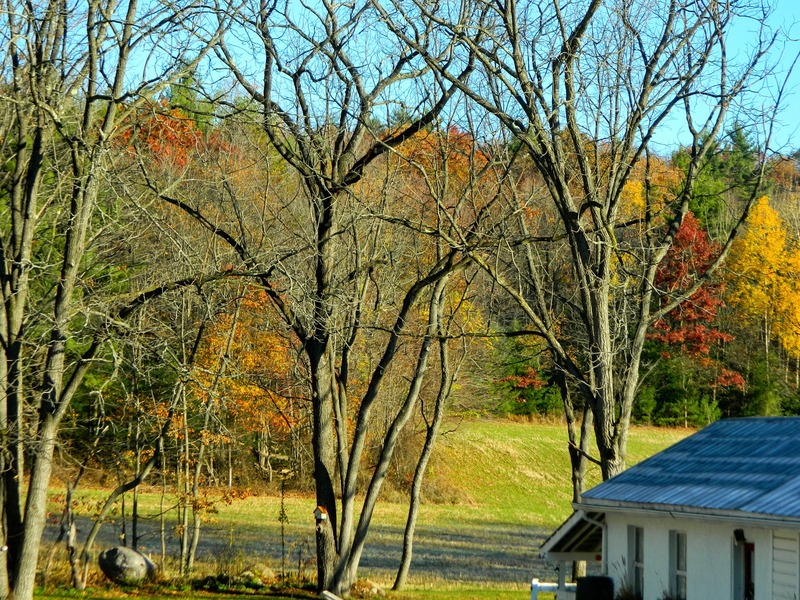 The catalpa trees are beginning to shed their leaves. Have you planted bulbs this year? Mine were a lot of work, but I believe they will pay me back in the spring. At least the daffodils will. There's still some color in the top field.